The stake of mixology which have been made for many years. Grupo Fedola in its establishments of GF Hoteles is a quality symptom to the advanced services. It is a clear example of the recent XIII Costa Adeje Mixology contest, celebrated in the facilities of GF Gran Costa Adeje, that our mixologist Emilio Rodríguez won two prizes at the same time: the trophy of Young Barman and the trophy of Skills. This young mixology promise that start to be met like ‘he who always wins’ o ‘star mixologist’ due to the recent achievements in many competition, he illustrates his vision of this art, projects and period in GF Victoria***** GL hotel. “I started in 2013, when I studied the education cycle in restoration and little by little I made a hole in this world,” says the youngest of our barmen. And just eight months after starting his journey in our hotel, Emilio Rodríguez has already become one of the representatives of excellence of the way to understand the mixology that has Grupo Fedola in its GF Hoteles. His style is characterized by a very peculiar technique with the ideal touches for an author’s creativity. “I like to travel, to know the different bars, to go to the hotels of many places and to try what is done in other places”, he says. It is precisely that personality in his work that has earned him to win the Young Mixologist Trophy and the Skill Trophy in the latest edition of the Costa Adeje Cocktail Competition. Despite his triumphs, he is prudent when it comes to the current mixology scene. “Each contest is more complicated than the previous one. Everyone is renewing, everyone presents proposals never seen, participants spend their lives watching, studying, training… so it is increasingly difficult to make a hole. In the last national championship, we competed 16 autonomous communities and although in Tenerife the level is super high, that of my competitors is another world “. 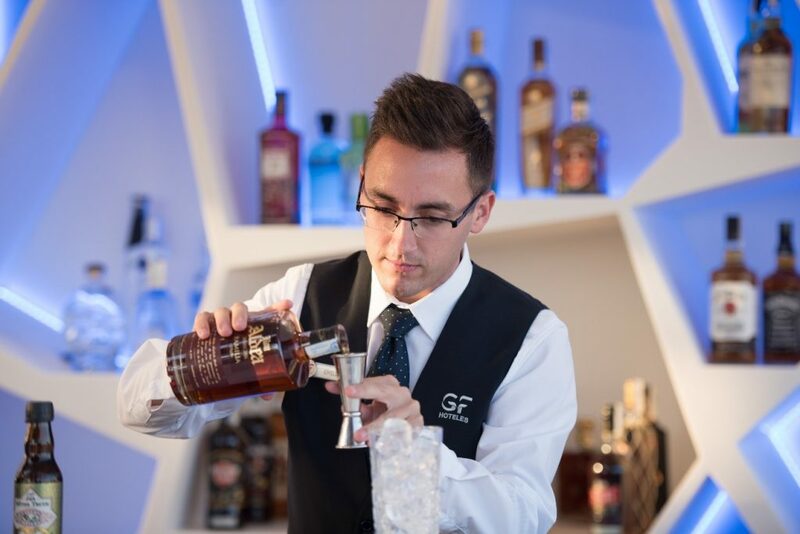 As a representative of the GF Hotels brand in cocktail competitions, Emilio has nothing but good words about what is now his home: GF Victoria ***** GL hotel. “Before arriving I spoke with the person who is now my bar boss, Pedro. He discussed me about the project and he told me that the company was betting a lot on the mixology, which right now is very much in demand in the south of the island. I feel very comfortable in a company that has that commitment and that takes care of its employees “. Also, aware of the quality that has been gaining as a professional in such a short time, Rodríguez also performs educational work thanks to the ABT (Association of Barmans of Tenerife), which is president the head of bars of our GF Gran Costa Adeje, David Arrebola. “I go to colleges to offer formation about mixology. As a young barman that I am, I usually go to Canary Islands educational centers to teach them about technique and flavors. I come from where they are, so I understand the value of knowing with what method of work they will find when they go out to work”. Rodríguez has come to GF Victoria ***** GL to break molds, both regarding his age and his creations. The guest who discovers his work can meet an author who does not believe in the essential ingredients and who likes to vary continuously and, above all, evolve. This entry was posted in Experiencias and tagged cocktail, gf hoteles, GF Victoria, mixologist.